Warm, umami, filling, nourishing. All six tastes: sweet, sour, salty, pungent, bitter and astringent. 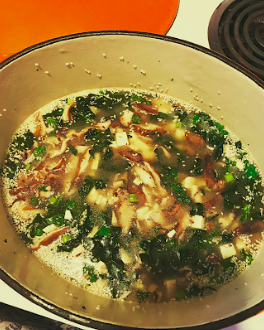 Miso soup is comforting, mega umami, fast and kind of impressive to make at home. It’s a complete meal, though you could serve with scallion/sesame white rice on the side if you are extra hungry. Mushrooms are earthy, and in Ayurveda can be heavy and dulling to some people (especially kapha types), but I find mushrooms to be deeply grounding and calming this time of year. In a med pot, heat up ghee and fry shiitakes until golden brown, about 5-8 minutes. Stir every few minutes and season with salt. While mushrooms are cooking, slice the tofu into chunks the size of iphone 4. Press tofu between paper towels to dry out. Chop into little bites and push off to a corner of your cutting board. Chop greens (remove tough stem if using kale or collards) and push to another corner. Chop scallions and basil. When mushrooms are golden, scoop out of the pot into a bowl and set aside. Add water to the same pot without cleaning it, bring to boil then throw in greens. Reduce to simmer for 2-4 minutes until bright green. Add tofu and cook 2 more minutes. Turn off heat. In a cup (I used a 2 cup glass pyrex measuring cup) ladle about 1/2 cup of the broth and add miso paste. Mix completely with a fork or whisk. Add mixture back to the pot along with sesame seeds, dulse flakes, scallions and basil. In a mason jar, add chopped tofu, sauteed shiitakes, greens that wilt fast (like baby spinach), chopped scallions, chopped cilantro, and 1 tbsp miso paste. Cover and refrigerate at work. At lunch, add hot water to mason jar, mix miso paste with fork, and enjoy hot soup without a microwave. Two cups of shrooms cook down quite a bit. Brown them! One pot meals rule. This was done in 20 minutes!